Question: Is the climate really changing and warming? Answer: The graph above shows a record of average global temperatures over 131 years spanning 1880 to 2011. You can see an obvious upward trend. The scale on the vertical axis uses “0” to represent the average temperature over the entire 131 year period. Positive and negative values are variations from average measured in degrees Celsius (°C). Thus, 2011 was 0.51 °C warmer than the average, and about 0.8 °C warmer than 1880. The graph starts at 1880 because that’s when weather data first started being recorded regularly and accurately. The GISS (Goddard Institute for Space Studies) data shows what are called error bars (the vertical gray lines). Those bars indicate the probable range of uncertainty in the data. Not surprisingly, earlier data is less certain. Using error bars is standard protocol when reporting scientific data, and indicates the level of confidence in numerical values. As more sensors are distributed over both land and sea, and satellite measurements are included, the error bars decrease in size. The data indicate that the average global temperature is increasing, and it’s a long-term effect that has persisted for at least 131 years. That’s climate change at a probability level much higher than 3σ. The evidence for global warming is out there, and it’s indisputable. This amazing footage shows the largest glacier calving event ever recorded on film — a chunk of ice 1.5 km x 4.5 km x 1 km (1 mile x 3 miles x 3000 ft) dropping into the sea. Scientists can examine ice cores drilled from glaciers, and rock cores drilled from the ground, to learn about temperatures, atmospheric composition, volcanic or cosmic debris, and species of life dating back 750,000 years. Those analyses reveal that Earth’s climate has changed significantly many times in the past. 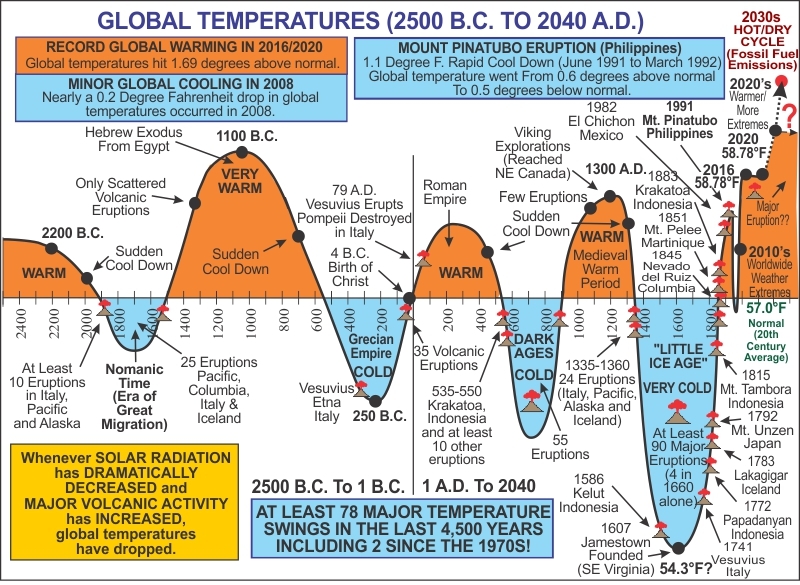 The information displayed is a bit dense, but take a look at this chart, showing temperature variations back to 2500 BC. And this is one of the puzzles about which even scientists are not unanimous. Is the warming we are seeing now just another natural variation, or is it something else, something unprecedented in climate history? While not unanimous, 97% of published scientific papers support the idea that global warming is real. That’s a better consensus than exists for “dark energy” or “life on Mars” or any number of current scientific hypotheses. The climate is changing, and it’s toward a warmer global temperature. The only remaining question is: Are human activities causing climate change, or is it being caused by natural phenomena?